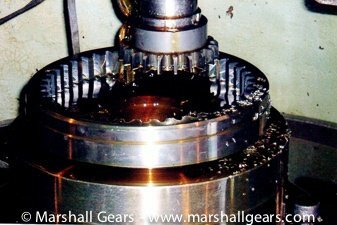 Internal gears transmit power between parallel shafts, just like spur and helical gears. The big difference here is that the teeth point inward, toward the center of the gear. This type of gear is used mostly as a part of planetary gearboxes. We also have internal and external shaper cutting capabilities up to 1800 mm diameter with up to a 150 mm gear face, and of 1600 mm diameter with 275 mm face width using our late model gear shaper, also holding up to an AGMA Class 8/9. This is one of the largest Internal gear shapers in western India. As An Internal Gear Manufacturer, We manufacture the following Types of Internal Gears. 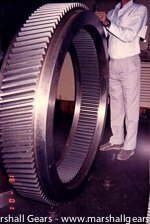 We manufacture Girth gears in 2 segment construction or single piece depending on the application. We supply these to the Cement, Steel, Mining, Engineering, Marine, Sugar Industries. Materials used are Cast Steel grades like 2644 Gr II / IS 2708 Gr II. If the Girth gear construction has Ring shrink fitted on Cast Iron Hub, then 42Cr Mo4, EN 19, EN 24 are used. We manufacture Pinions from forging materials like EN 9, EN 19, EN 24,etc. We manufacture Pinions in all the standard and non standard modules right up to 50 Module. Do you need Internal gears with large face width ? A Large Diameter ? or a large numbers of teeth? Well we can make those problems go away with ease. Let Marshall review your next gear program, and show you how we can save you time and money with state of the art processing. Internal Gear Capacity : Less than 10 M - 1600 mm Internal Dia. Above 10 Module - 3000 mm Internal Dia. Founded in 1964 by Sri. 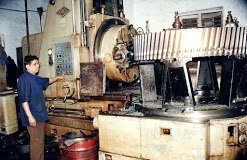 Ajit.S.Arora, Marshall Gears has come a long way from its beginnings in a small Industrial Gala at Chakala, Mumbai. Marshall Engg Works, Plot no 94, Rd no 16, MIDC, Andheri East, Mumbai 400093. Mon – Sat – 9:30 am to 6 pm.